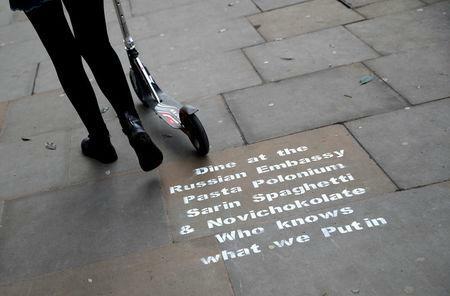 LONDON (Reuters) - Opponents of President Vladimir Putin used graffiti on Thursday to take an ironic swipe at Russia over the nerve toxin attack on a former double agent. Britain and Russia have been trading public insults over the use of a Soviet-era nerve agent called Novichok to strike down former Russian double agent Sergei Skripal and his daughter Yulia in the English city of Salisbury. 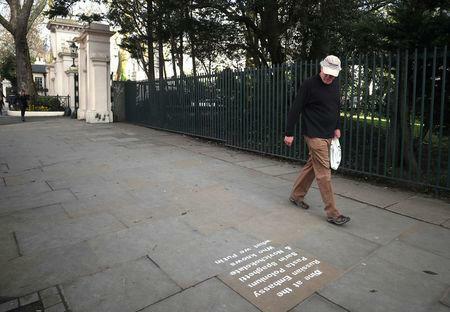 "Dine at the Russian Embassy," read the white graffiti stenciled onto the pavement near the Russian embassy in London. 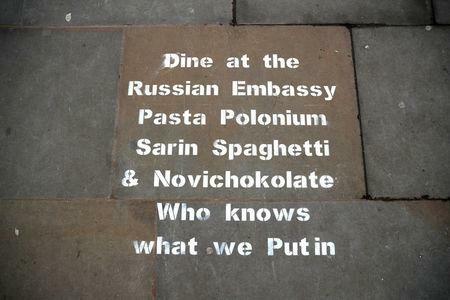 "Pasta Polonium / Sarin Spaghetti / & Novichokolate / Who knows what we Putin"
In response to the attack, Britain has given 23 Russians who it said were spies working under diplomatic cover at the London embassy a week to leave. Russia denies any role in the poisoning and has vowed to retaliate against Britain for the expulsions. In 2006, green tea laced with radioactive polonium-210 was used to murder ex-KGB agent Alexander Litvinenko, a critic of the Kremlin, in London. A British inquiry said Putin had probably approved the murder of Litvinenko, though Russia denied any involvement.